Toronto, Ontario, December 13, 2012 – The Canadian Association of Genetic Counsellors (CAGC) released their position statement on genetic discrimination. The CAGC believes that the public should be protected from genetic discrimination and that legislation is necessary to ensure this protection. The potential for genetic discrimination remains relatively unknown to the general public. Genetic counsellors care for individuals and families with genetic conditions and so are in a unique position to witness genetic discrimination first hand. The potential for genetic information to be used unfairly against a large proportion of the general population will increase as the understanding of the genetics of common disease like heart disease and diabetes expands. In response to these concerns, the CAGC has developed a position statement on genetic discrimination (see attached). The position statement clearly outlines the organization’s belief that the public should be protected from genetic discrimination and that legislation is necessary to ensure that this happens. The CAGC is opposed to genetic discrimination. Genetic discrimination is defined as the unfair use of genetic test results or genetic risk determined by family history. Individuals should not be deterred from seeking genetic services, undergoing genetic testing or participating in genetics research out of concern for genetic discrimination. Individuals should not be coerced to undergo genetic testing by third parties. The decision to have genetic testing is a personal one and should be at the discretion of the individual. Individuals should be protected from genetic discrimination by employers, insurers and society. 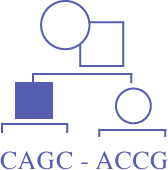 The CAGC supports and encourages the immediate development and implementation of legislation to protect the Canadian public from unfair use of genetic test results or family history.